Did you know that the Jetsons are parishioners of Mount Pleasant Lutheran Church, Racine, Wisconsin? You know them: George, Jane (his wife), daughter Judy, and his boy, Elroy. Outside the world of futuristic fiction, they must have had an influence in the design of this church building, which is known regionally as “The Space Ship Church.” Built in 1974, it is a dish with an inverted saucer as its roof, and large plate glass windows surround the perimeter, filling in the space at which the two join. This building’s unique shape determines how it is accessed, and used: functionally and liturgically. Ahead of its time in terms of accessibility, upon entering at ground level, one enters the lower level fellowship areas and upper level worship area by a series of switch-back ramps which wind around the building’s diameter. 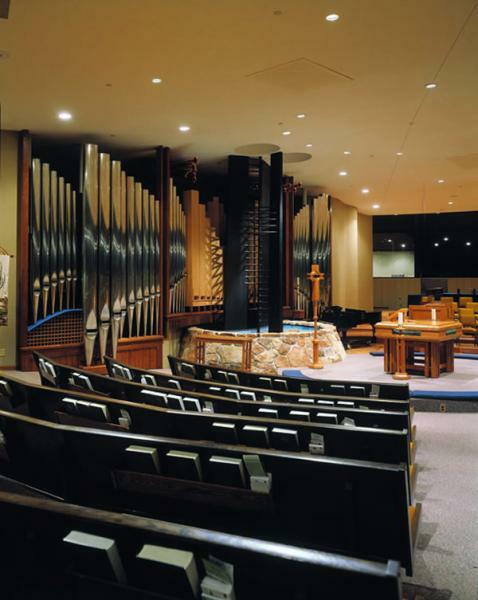 The building’s shape also determines the building’s acoustical environment, and therefore the limits of a pipe organ’s physical and tonal design. 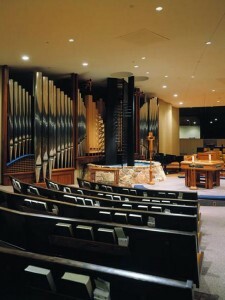 Consultant Scott Riedel guided the Church in improving the acoustics, and creating an improved area for music-making, by altering the shape of the walls facing the congregation, filling in gaps between ceiling beams, and replacing the carpeting in the choir’s seating area with hardwood flooring. And, in fact, sound is now heard more clearly and evenly through the room, especially in the outer ring of seating at the edge of the room’s diameter. But, the remaining carpet and pew coverings, and the somewhat flexible frame construction, do their work too well, absorbing bass, and amplifying treble frequencies. We were able to observe this phenomenon clearly before the Church’s former organ was removed. The 16′ pedal sounds were weak in the Church, but in the lower level Fellowship Hall, the tone boomed to overtake normal conversation. The Organ Chamber, while perfectly sited across the front of the worship area, is horizontal in nature, with a maximum ceiling height of 14′. Congregational seating comes to within three feet of the organ’s left side; the choral singers are about six feet from the right side. The wide layout, and very present location of the organ, demanded that the design be practical, and required a very gentle touch in its scaling and voicing. Since the pipes could not be elevated above the congregation’s heads, the sound is produced directly at the level of people’s ears, requiring very refined voicing. The enclosed accompanimental divisions of the organ needed to be located to the right, nearer the choir, which meant that the Great needed to be on the left. People on the left side of the organ would be only four feet away from the Great Mixture. Oh yes, there were also four steel roof support columns in the organ chamber, in seemingly random places, which could not be moved, and had to be worked around. Those of you who have followed our work, or played our instruments, know that our organs have a smooth, warm, pervading, and significantly grand tone. They can be bright when they need to be, but the various stops are not inherently so. (The last thing we want to do is voice the high pitches in the Mixtures to be bright!) Our organs are not crowned by the high-pitched mixture-work (as in neo-classic organs), but by the heroic blend which results from mixtures and reeds singing together, reinforcing unison pitch. In the case of this Church, we needed to fill the entire building (basement included) with bass frequencies, and gradually decrease the intensity of tone as the pitches rose, in order to have the organ sound smooth, balanced in the tonal spectrum, and consonant with our artistic style. To have achieved the balance it has, whether one is sitting three feet from the Great Mixture, or in the outside ring, is a testament to the organ’s solid construction, painstaking attention to scaling, and countless hours of listening and adjusting the sounds in the church. The result is that the Great Chorus almost leaves you wanting more â€“ until you listen to the organ when the room is full of people. Our head Voicer, Brian Davis was promoted to the position of Tonal Director as a result of this organ’s success, in the face of such overwhelming challenges. 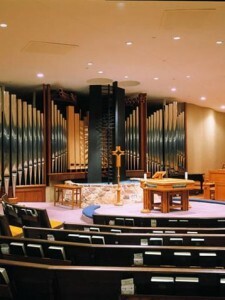 The visual design’s “prime directives” were to bring order to random asymmetry, lead the eye toward the center of the worship area, emphasize what little verticality the space actually has, and give a dignified prominence to a steel sculpture in front of the organ—the base of the Church’s three-bladed steeple, which pierces the roof and ascends to a needle point in the sky. The three arms of the steeple are of unequal width, connected by horizontal welded rods, and form a sculpture in the nature of a cross. Original descriptions of the sculpture allude to the Trinitarian symbolism of its three-blades. The Organ Chamber is located immediately behind the sculpture, the center portion curved in the outline of the stone font, the sides on a slightly reverse curve as the Chamber returns to the side walls. Aside from the planned asymmetry of the steel sculpture, the exact dimensions and precise placement of the Organ Chamber behind the sculpture could not be ascertained until the old organ was removed, and the Chamber developed by moving offices and closets, previously flanking the former instrument. The chamber space itself was asymmetrical as registered to the centrally located sculpture. We decided to design the organ’s façade in three sections, not only to emphasize the Trinitarian symbolism, but to give us some constructional flexibility in reconciling the many dimensional variables. Even though everything was accurately constructed in the shop to careful measurements taken once the organ chamber was constructed, we still needed to do more woodworking on-site than we would have liked, or than other situations have ever required. The center section, being behind the flat-black steel sculpture, needed some visual grounding, but not heaviness. The former organ was basically dark, with lots of black grille-cloth, which made the steel sculpture disappear. We therefore displayed the centrally located large wood pipes in a light, natural-finish in the center section, with the horizontal bright polished copper reed resonators wrapping themselves around the sculpture from above and behind. This central display is symmetrical, and acts as a perfect backdrop to gently soften the tension created by the wide-versus-narrow blades of the sculpture in front. The low octave of the 8′ Pedal Principal flanks this display of the wood pipes, the pipes being mounted on angled toeboards which follow the curve of the Font, to act as a transition to the façade’s side elements. The tonal design of this instrument is fairly typical of what we do, with the exception of the four stop Solo Organ, which is at home on the bottom manual keyboard. The Great, Swell, and Pedal are full and well-developed, consonant with our style. The Solo offers some evocative coloristic sounds, and the flexibility of a third keyboard, in a situation in which there was neither room nor money for a full Choir Organ. Usually our organs’ solo reeds are Tubas. But, in this close acoustic, we were extremely concerned that the high volume, located so close to the listeners, would drive them all out onto Green Bay Road. We therefore opted to make these Trombas, on lower pressure, with slightly more open shallots for a relatively dark tone, but at a solo volume in balance with the rest of the organ. The Great 8′ Trumpet is truly a luxury. This Trumpet is a beautifully blending chorus reed, and in fact the Great 4′ coupler can be used without this division becoming too loud or bright. The Swell reed battery, though, is what’s worth writing home about! Here’s the power in the organ, beautifully tailored for its uses in a wide variety of contexts, but it is never too loud in the room. The Swell 16′ Bassoon, which plays in the Pedal as well, perfectly balances not only the Swell battery, but also the Great full chorus for those many times when it is used as a “pointed’ pedal reed when the darker, heavier Trombone would be too much. It has been a pleasure to work with the people of Mount Pleasant Lutheran Church, and consultant Scott Riedel, on this new instrument. 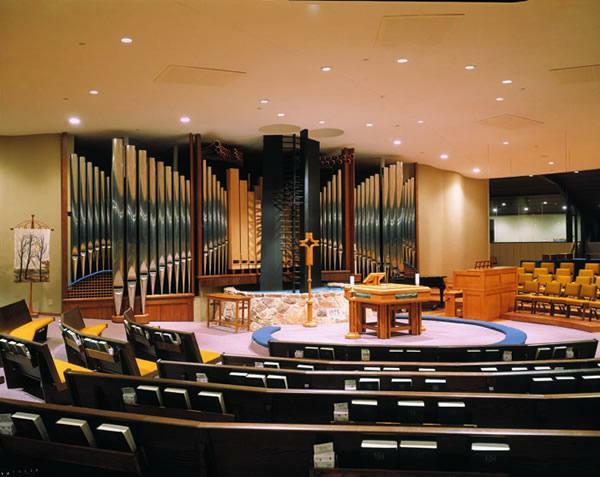 Pastor Stephen Samuelson, Music Director Joshua Brown, and the Organ Committee fell in love with our instruments after hearing the organ we built at Saint David’s Episcopal Church, Glenview, Illinois. Their vision for how the new organ would transform their unique worship space was inspiring. It was our privilege to be given the challenges and create something truly beautiful. Fortunately, like any good Lutheran, I put my trust in God’s abiding grace, and returned to Mt. Pleasant as their organist and Director of Music to discover the beauty of this building. A ribbon of windows keeps the outside world in plain sight and the roof line surrounds the building with a crown of thorns. The triune tower rises up from the baptismal font, punctuating this architectural statement which has served as the church’s very best evangelism tool since its completion 30 years ago! The church’s former small organ had been assembled in an ad-hoc manner through the years, and suffered from the oppressive acoustical environment and poor chamber layout. With the able guidance of Scott Riedel and Associates, the church crafted a plan to remodel the sanctuary, double its reverberation time, and replace the aging organ. The Organ Committee considered many fine builders. John-Paul Buzard’s warmth of tone, quality of workmanship and, to quote the Senior Pastor Stephen Samuelson, “bang for the buck,” all contributed to the church’s final selection of his firm. This unique American church required an equally unique American organ builder. John-Paul Buzard and his team tackled the church’s twin challenges of odd architecture and unforgiving acoustics with great aplomb. In the process they demonstrated that the best organ builders, particularly for American churches, need a chameleon-esque quality to fit a wide range of applications. From high gothic architecture with grand acoustics to restrained “prairie style” architecture with limited acoustics, John-Paul Buzard has adapted and delivered stunning results while maintaining his tonal style and uncompromising quality. Opus 34, the result of 3 years’ careful planning and execution, has both matched and enhanced the sanctuary’s architectural style. More importantly, it has brought an entirely new dynamic to the worship life of the congregation. With a tonal scheme based on a wide array of 8′ pitches, the organ fully supports the congregation’s singing and easily fills the room with sound. The two complete principal choruses allow the organ to lead congregations of from 10 to 600. The wide selection of reed and flute stops offers ample color and variety for responding to hymn texts and playing repertoire. The organ first played for worship on Reformation Sunday 2006, and Mary Preston will play the inaugural recital in April of 2007. I am grateful to all of the Buzard staff who worked at a strenuous pace to deliver and install our organ, and to Scott Riedel for his insight and guidance throughout the project. Finally, a special thanks to the staff, Worship and Music and Organ Committees, and members of Mt. Pleasant Lutheran Church who had the long term vision required to undertake this project.